I came in here looking for the thickness dimensions/specs on the front and rear rotors (more specifically their thickness prior to use/wear) and thought I was going to have to ask for the dimensions. Then I saw Wizard-3000's post. Are those numbers accurate for a BNIB OEM rotor? 24mm front and 18.2 rear? So I've tried searching and I can't really find what I'm looking for. First I'll start with, I bought my car with 15k miles, it now has 17k. The brakes squeek every now and then, but it's only just louder then road noise. I just imagine it's dust/buildup. I know the car was tracked a couple of times, and I haven't bothered to take a look, but I'm assuming at the moment they're fine. But when the day does come I need new ones, I was wondering what the OEM pads are, and where you can purchase them? Also this is my DD, so quite and clean are preferred to heat resistance and resistance to fading. (I doubt i'll need to do 6 panic stops in a row, if I do I'll have bigger concerns then brake fade). The brake pads that came on the car had a tendency to squeal. You should be due for a new front set. Just go to your auto parts store and tell them what your looking for when your set to replace them. They most likely have different brands and different models within each brand. Hey, does anyone have the part number for a replacement kit for the brake master cylinder ? Also any info on availability and cost. All of your salient points are echoed in the text of my Brake FAQ and I agree with everything you said. It's just that Wizard3000 is just doing daily driving with OEM pads and the rather large expense of 2-piece rotors seems like overkill and unecessary for his type of driving. It's a lot of money to reduce unsprung weight, better spent on lightweight wheels I would think, but you make a valid point. Great thread Jim, any good resources for comparisons of the 2-piece rotors vs. the one piece, and who carries the 2-piece rotors? I recently purchased an RX-8 race car! So somewhat new to the 8. The car has Cobalt pads on it now, sounds like you like them, I'll stay with them. Last edited by cpa7man; 10-09-2011 at 10:14 AM. I believe TH Motorsports, one of the site vendors, has the 2 piece brake rotors available for our car. I don't know what organization or class you are racing your car in. Many more vendors have big brake upgrades available. Justjim thanks for such an informative thread. I've one question. I believe I have build up on my rotors as you've described. Rotors and pads are stock. Can I simply rebed the existing rotors and pads to eliminate the pulsing or do I have to replace the pads with a higher temp pad to melt off residue? My 8 is 2004 A/T Touring. Find More Posts by AMCsellout? "Use the steel wool and brake cleaner or Brillo pad to scrub off the build up. Since this deposit was emitted from the brake pads at high temperature therefore it may not be easy to remove the deposit without heating it up, in this case you will have to heat up the rotor surface with a torch and repeat the scrubbing with coarser steel wool." CPA - I'm just down the road from you in Trophy Club. Let me know if I can be of any assistance. Last edited by TeamRX8; 01-08-2012 at 09:28 AM. I purchased my 2008 GT in December of 2011 knowing I had to do the brakes. There was a lot of shake and just figured the rotors were warped. I have finally got time to look into getting new rotors (shake was annoying the crap out of me and getting worse) and was searching around here looking for replacements and came across this thread. Thought to myself, this is worth a shot, let me try it. Well crap. Apparently I have thrown away a few good sets of rotors on other vehicles I have owned! 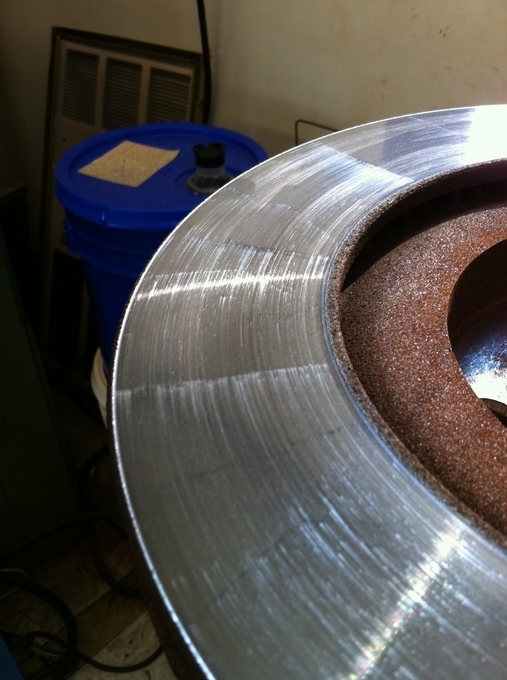 I cleaned theses rotors up and they are as good as new. WOW! I hit them with a 4 1/2" hand grinder with a wire wheel and that is all it took. I will try attaching a picture of the before and you can definitely see sections "that are not like the other". Thanks. Incredible information that saved me several hundred bucks. ^ Try setting up a DIY instructions on what you did. Are the front and rear pads the same for both the sport and base suspension or are they different? They are different. The sport package has larger front brake calipers and rotors, so the pads will coincide with the size of the calipers. Correct me if I'm wrong guys. But I'm fairly confident that I am correct. Sorry for the double post here, but my answer was incomplete. If am not mistaken, from what I read in the first post of this thread, the rear brakes are the same between sport and base. My Wife is a long time RX owner (two RX7's and current RX8 2005 Shinka - MANUAL). She's a "spirited" driver in her heart (actually pretty skilled when she pushes it) but nowadays is pretty much just doin' the commute thing. Car has about 50K and needs brakes. Time was when I'd do it, but don't have the place or time, so I've got to rely on a shop (much to my GREAT dismay since I'm a bit of a perfectionist!). The main Q is - there seems to be some confusion at both the shops I got quotes from as to if the Shinka has the Sports package, since that has different brakes than the "standard" RX8. I'm inclined to say yes, it's the sports brakes as the Shinka was a special top of the line package. Did it have special brakes, or the same as the Sports package? The other Q was general advice - One shop quotes ~$500 for all 4 corners with "Ceramic" (yeah, right) pads AND new rotors, 2 yr Warranty. Claims he won't turn 'em "because they will warp again" (my BS indicator started ringing at this point!). Second shop quoted just over $1K to include new rotors claiming Fronts were like $329 and Rears $250 for the rotors, but HE wanted to turn them and said he never has problems doing it. 1 yr Warranty. The second shop sounds like he's using quality parts (or just gouging!) and I'm concerned the 1st guy isn't, plus the BS about needing new rotors and turning doesn't work (since it's usually deposits ANYWAY!). Comments, thoughts, thrown rocks, all appreciated! all 6-speeds are sport suspension. Nothing special with the brakes. Shinka's had different shocks but brakes are the same. find out what the guy is giving you for rotors and pads at each place. $500 is good if it's Hawk Ceramics (~$150 all 4) and Centric Premium Rotors (about ~$250 shipped all 4). I'm willing to argue that the Centric Premiums are the best all around factory replacement and usually cheaper and better quality than most anything out there. Is this the correct size brake pads for OEM brakes? is there any other cars with bigger brakes that will bolt up to our cars instead of buying a big brake kit? good question, i wondered this also. Like adapting the evo's brembos etc etc. I do not come to this site often, it's been a long time since I've checked in. I've got an '04 RX8 that I just had in the shop for an engine issue, which was apparently a false alarm. They did an inspection and told me the front rotors and pads are in need of replacing. I got a quote of $533 to replace just the front. I don't know who makes the gear, it wasn't put in the paperwork. I could call and see if they will tell me. But looking at the post a few up, from fuz, 4 rotors for $250, and assuming pads are about $100, I have a feeling their quote is a little high. I've never had to replace rotors on a car before, so I wouldn't want to do it myself, I don't have any equipment/area to do it anyway. Is it feasible that I could buy the rotors and pads online and then have the shop put them on? Seems like something a shop would not do. I was looking at this as well. Specifically the CTS-V brembo brakes, they are SUPER cheap to purchase (vs evo/350z/370 brembos). Call them in advance and ask. Some do, and some dont.